The new FPA touch! Fiber Potential Analyzer. For titration of liquids, titrator can be connected. Surface charges of fibers, fillers, particles or colloidally dissolved substances in stock suspension are defined by the Zeta Potential on their surfaces. The charge of the stock suspension can be split into the colloidal and particle charge, measured with the CAS touch! 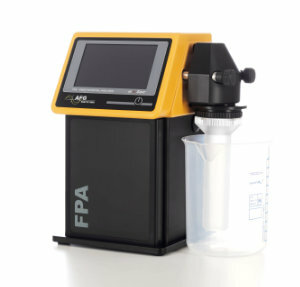 Charge Analyzing System, while the fiber and filler charge is measured with the FPA touch! Fiber Potential Analyzer. All both charge levels together define the overall Zeta Potential of fiber suspensions. The knowledge of the fiber charges in the pulp is the key for optimized dosage of chemical aids, which should be adsorbed onto the surface of the fiber. The mostly negatively (anionic) charged fiber is adsorbing the positive (cationic) charged additives in the papermaking process. The optimized dosage of such aids always depends on the Zeta Potential within the pulp. The FPA touch! is designed to determine the Zeta Potential of fibers according to the Helmholtz-Smoluchowski equation by simultaneously measuring conductivity, pressure and the streaming current potential. The measuring principle is based on the streaming current potential measuring method in a fiber plug. That fiber plug is automatically building up on a screen electrode in the measuring cell of the FPA by a vacuum. By periodically changing the vacuum during the measurement the charge clouds absorbed on the fibers are moving with the liquid stream and generating the streaming current potential measured by the screen and ring electrode.